Whether a species can evolve to survive climate change may depend on the biodiversity of its ecological community, according to a new mathematical model that simulates the effect of climate change on plants and pollinators. The findings, published in the early online edition of Evolutionary Applications, are important because some species that have survived large climatic change in the past might not be able to survive current and ongoing climate change. In the study, researchers used computer simulations to examine the effect of climate change on populations of flowering plants and their insect pollinators. Ecologists have known for many years that climate change alters the timing of when plants flower and when insects emerge. For example, the onset of new blossoms in many temperate plants in the Northern Hemisphere and the first emergence of some insects have occurred earlier with global warming. If climate change causes species that rely on one another, known as "mutualists", to be active at different times, then these species may be threatened with extinction. The question that remains is whether the process of evolution can mitigate the potential damage that climate change can inflict upon the timing of life cycle events. Researchers found that in some cases evolution can rescue plant-pollinator mutualisms that would otherwise become extinct as a result of climate change. Whether a mutualism survives, however, can depend upon the density and distribution of other species in the community. For example, under many circumstances, the presence of alternative pollinators available to the focal plant can help to protect both the focal plant and the focal pollinator from extinction. 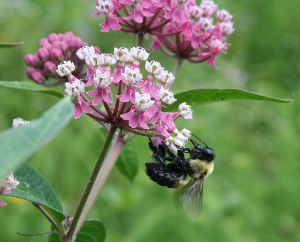 "In such cases, habitat fragmentation or loss of native pollinators might compound the threat of climate change to mutualisms," said Tucker Gilman, a postdoctoral fellow at the National Institute for Mathematical and Biological Synthesis and the paper's lead author. Mutualists are likely to be especially sensitive to rapid climate change, according to the study. "The results are troubling because anthropogenic (or human caused) climate change is thought to be happening up to ten times faster than any natural climate change in the past 500,000 years," Gilman said. "This means that mutualisms that have survived past climate change events may still be vulnerable to anthropogenic climate change."